The amount of polyphenols found in popcorn was up to 300 mg a serving compared to 114 mg for a serving of sweet corn and 160 mg for all fruits per serving. In addition, one serving of popcorn would provide 13 percent of an average intake of polyphenols a day per person in the U.S. Fruits provide 255 mg per day of polyphenols and vegetables provide 218 mg per day to the average U.S. diet. The levels of polyphenols rivaled those in nuts and were up to 15 times greater than whole-grain tortilla chips. The hulls of the popcorn — the part that everyone hates for its tendency to get caught in the teeth — actually has the highest concentration of polyphenols and fiber. Popcorn may be the perfect snack food. It’s the only snack that is 100 percent unprocessed whole grain. “We did our own digestion (research) that doesn’t use enzymes, and you as a human being have enzymes and different pH changes to digest food,” he said. So there’s a good chance those antioxidants are getting digested and absorbed. 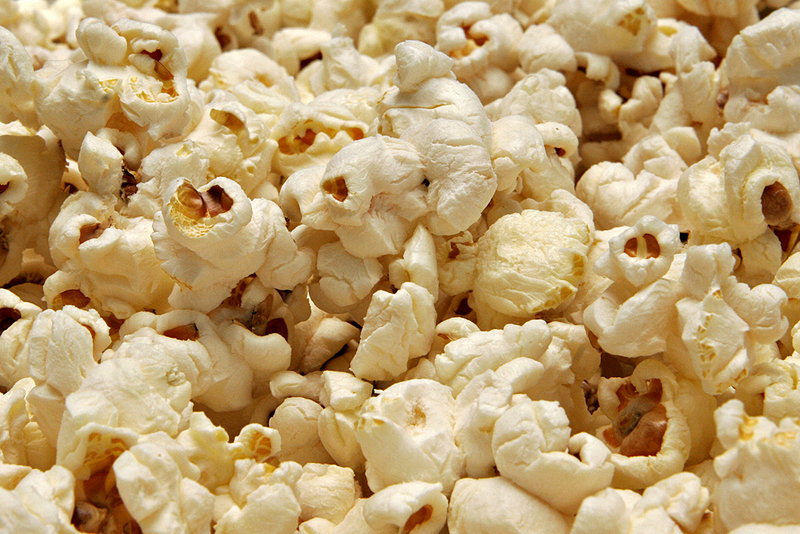 Popcorn is whole grain, high in fiber, low in fat, low in calories, and high in antioxidants. There’s not a lot out there that can compete with that. This entry was posted in Uncategorized on November 8, 2015 by Bix. Good to know there’s something that’s easily available and is healthful too. Also that even though approximately 90% of corn grown in US is GMO, the good news is that GMO corn doesn’t pop. I try to always buy organic corn for popping but at least there are no GMO worries. Think I’ll pop some right now, it’s a gray rainy day, just right for it! I bought some popping corn yesterday. Arrowhead Mills. I just made some. I have never in my life had almost every kernel pop! Maybe it was a fresh bag or maybe as you say it was organic. I use an old, old air popper too. Pop corn is non-GMO. It is from a different variety of corn seed. I guess the crop is just not big enough ($$) for the GMO seed producers to worry about. I make my popcorn in a Nordic Microwave Popcorn bowl. Works great and no mess. The bowl costs about $10. It takes 1/3 cup popcorn and makes about 12 cups of popped pop-corn. No oil or butter needed. It takes 2 to 4 minutes in the microwave. Then after it is popped, you can add butter, salt and other favoring that make popcorn unhealthy. I learned to eat it plain. It goes well with a streaming Netflix movie. How about that. I didn’t know popcorn wasn’t GMO. You know … it does look different than frozen corn kernels and regular corn on the cob. Smaller and more round. I think it may be time to upgrade my popcorn maker. I’m going to guess that its plastic is probably melamine. And it sounds like a jet taking off when I turn it on. And at $14.50, the price is right. Thanks for this tip, RB. I got mind at Target for $8.99. I think it is also on Amazon for less than $10. It doesn’t sound like a jet engine. I just hear the sound of popcorn popping. A lot of stream is created. The inside of the cover gets wet. The bowl is very hot when the popping is done. I recommend pot holders to remove the bowl from the microwave. It takes about a minute to cool down to touch. Made of gemstone, an unbreakable, chip-proof cookware material, the Nordic Ware corn popper efficiently transmits microwave energy directly to the popcorn kernels, popping them quickly without oil. The last couple times I had popcorn, I ate it without salt. I had already ditched the oil but I thought, no way, not the salt. You know what? It’s not bad … not bad at all. My experience is the same. I ditched the salt and the butter. It is actually good. Without oil, butter and salt, the the clean much easier too. I also learned to eat baked potatoes with butter and sour cream too. Much healthier.